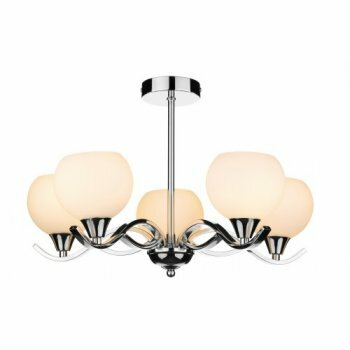 Dar Lighting Aruba 5 light ceiling fitting features a circular design ceiling plate with central rod, all in a polished chrome finish with curved arms and globe shaped opal glass shades. The product code for this Dar ceiling fitting is ARU0550. This simplistic but stylish design has a truly modern look making this a perfect choice for modern decors and is ideal for rooms with low ceilings. The Aruba collection includes a 3 light ceiling fitting and a single light wall fitting which can be viewed on our website.